This card's artwork is a view of the head of Harpie Lady through a kaleidoscope. This is also supported by this card's Japanese name. 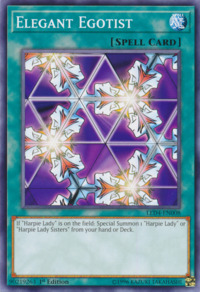 The fact that multiple heads can be seen in this kaleidoscopic view probably references this card's effect to Special Summon another copy(s) of Harpie Lady. This was the first card to Special Summon monsters from the Main Deck (when it was first released in Japan). Horn of Heaven: "Horn of Heaven" cannot be used to negate a Special Summon that results from a Spell, Trap, or effect of an Effect Monster Card. You cannot use "Horn of Heaven" to negate a Special Summon from "Elegant Egotist", .